Do you remember the “Guinness Project M” article JAPAN Style posted at the end of the last month? This grand project was carried out by the members of “Project M” in Nagato city, [W:Yamaguchi Prefecture]. 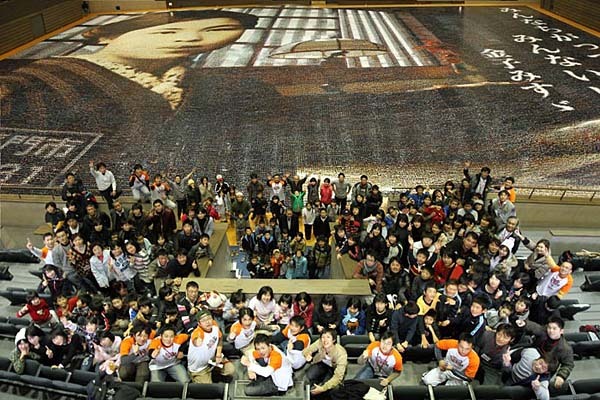 On the New Year’s Eve, 220 Nagato citizens placed all the pictures that were collected mainly online, and spending more than six hours, they completed the huge mosaic art. 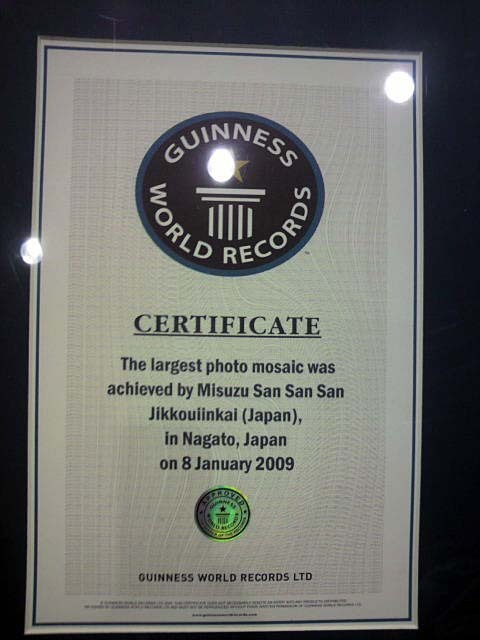 In the presence of Guinness Committee, the number of photos and the size were checked, and it was officially certified as the largest photo mosaic art by Guinness on January 8. The number of photos is exactly 120,000, and the size is 31.78 m long, 42.82 m wide. Since it is a big record, not only a local news paper but a television news program reported it. The lady in the mosaic art is a Japanese famous poet of nursery rhyme, [W:Misuzu Kaneko] (1903-1930), who was born in Nagato. “Everyone is different so everyone is wonderful” by Misuzu Kaneko. There is no one the same as you in this world. In the Misuzu s message, I think, there is her message that you don’t have to be anyone else but you, and hold your identity dear. The smiles of the project members are wonderful in the first picture on the top. Those are the faces of the people who accomplished their goal. Although it’s been full of dark news in Japan lately, the members of Project M gave inspiration and courage to accomplish mission to people.